An evaluation of survey data quality under various conditions. In late 2015, TapResearch commissioned DM2, a digital marketing & measurement company, to conduct research-on-research to assess if there were any discernable differences in sample characteristics and response quality among sources utilizing different respondent incentives. DM2 utilized a multi-faceted survey with quality scoring algorithms to compare results for the different sample types. Sample was acquired in partnership with Lucid, who selected providers that met the defined characteristics of the study – while keeping sourcing companies blind from DM2 and Tap. 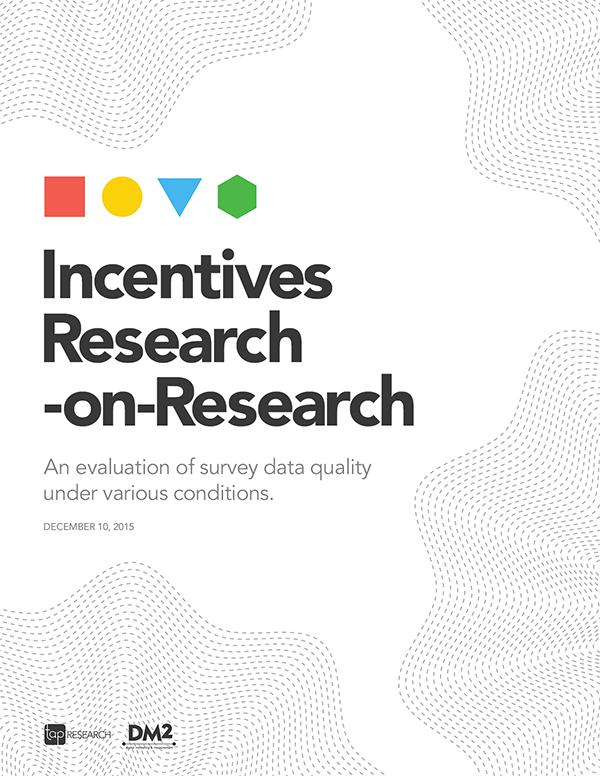 Key findings obtained from the study were many, including indication that respondents receiving and preferring cash-based incentives may be more prone to provide lower quality survey data, and that there are some fundamental differences in exposure to and participation in research based on the platform from which respondents engage surveys.